I don't think it's an understatement to say that Teslagrad was one of, if not my all-time favorite Wii U eShop game. You can read my original review for it right here, and all my points here remain basically the same. But since I loved the game so much back then, I don't think I'll be able to keep myself from gushing over it all over again, though probably in a more abbreviated format. It boils down to this - if you have ever, or plan to ever buy an indie title for the Nintendo Switch, you really can't do a lot better than Teslagrad. This game is a masterpiece, and one I'll play again and again. First off, the opening to the game is... transcendent. There really isn't a better word for it than that. You are snuck into a safe house as a baby, time passes and eventually goons of unnamed origin or motivation break in, forcing your character, now an adolescent, to escape across the rainy rooftops of a pseuo-Russian cityscape. With rooftops to jump over and bad guys in hot pursuit, the game forces you to learn the controls and nuances of movement without a single word of explanation, and the electricity (pun intended) only starts there. After a breathless chase, you find yourself in a seemingly abandoned castle, safe from the pursuing goons but unaware of what waits ahead. What follows is a puzzle platform adventure with hints of Metroidvania perfection that won't take you ages to complete, but will stick with you long after the credits roll. The gameplay revolves around getting from point A to point B, mostly, with some boss battles thrown in. The wrinkle is a gauntlet that controls the polarization of electrical platforms and objects, and some of the puzzles are sublime; not obtusely impossible, but requiring some real thought. 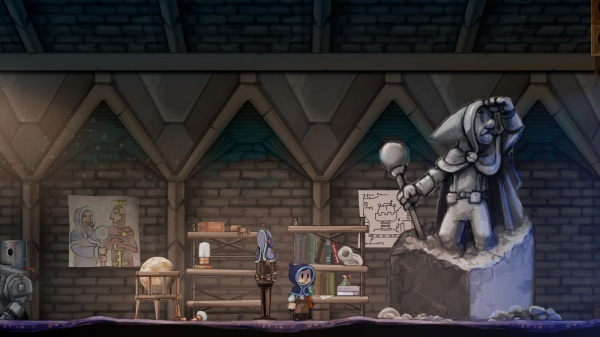 I've played a few puzzle platformers (well, more than a few) since I reviewed Teslagrad on Wii U, and I find myself endlessly comparing them to this game, and always finding that no matter what those newer titles attempt, Teslagrad almost always did it better, with more style or with more satisfaction at actually progressing. My one complaint with the game really still stands, though since I've played and finished it a few times since then, it is lessened; fighting bosses can be tedious. Your character can take, like, zero punishment before he dies, so each boss battle becomes a string of trial and error, meaning endless death until you figure out the key to victory. Your first time through, this has the possibility of souring the experience, but don't let it; see Teslagrad through to the end no matter what. Now the game is on the Nintendo Switch, it has the added bonus of being portable. Sure, it is the same game as it was on the Wii U, but I always felt games like this fit better on portable systems than they did home consoles. And it's a pitch perfect port; there is no slowdown or frameskips whatsoever, so you get the full Teslagrad experience on the go, or on the TV again if you so choose, the Switch version offers the best of both worlds. If the whole "games as art" thing is close to your heart, you are looking for a puzzle platformer or semi-Metroidvania experience or you simply want something a little a different after finishing Doom, Mario Odyssey or Xenoblade Chronicles 2,Teslagrad is one of the best options available on the Nintendo Switch. Seeing as I gave the original on Wii U a 93%, I'm going to tack on two full points for the modern convenience of portability. So this version of Teslagrad gets a 95%. Final Rating: 95% - Portability makes it even better.